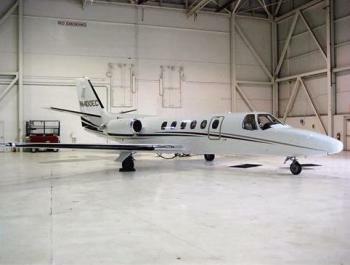 Very nice, owner flown, Citation II, with all the good mods and upgraded avionics. Same owner since October 2007. Interior refurbished shortly after purchase. Based in climate controlled hangar. No damage, on the special low utilization maintenance program by Toledo Jet. Aircraft has reversers, Freon Air, 14,700 lbs. ramp weight, aft belted lav, Garmin 530 AW / 430 AW, GMX-200 MFD, Skywatch traffi......more. Columbus, Ohio based corporation with late model, Pratt's Fully Paid Up ESP Engine Program. Shows well with new paint in 2008. Beige Leather interior for 7 Pax plus potty seat + 2 crew. For further information, contact Brad Willette at Lane Aviation, Columbus, Ohio: 614-237-3747 Ext. 159 . Airframe: 8104 Hours 6787 Landings Since New -------------------------------------------------------......more.